Formerly home to the king’s vineyards, this Prague district came into its own as a residential hotspot in the late 1900s. New developments in recent years and ongoing projects are reinforcing that desirability. VINOHRADY’S REDEVELOPMENT in the 1990s entrenched its expatriate population, without ostracizing locals. “It’s very popular for foreign people, who often buy as an investment. But for Czech people, to say ‘I have an apartment in Vinohrady,’ means something,” notes Jitka Václavíčková, business development manager at residencial agency Bonus. 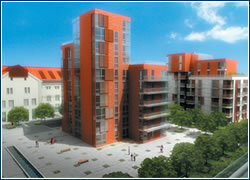 ” Vinohrady is usually second on the list after Prague 1,” affirms Jaroslav Žižka of residential agency EHS. “Clients expect traditional apartments with high ceilings, original details preserved in a completely renovated turn of last century building, more greenery than in Prague 1, and a better parking situation,” he explains, adding that prices per m2 are approaching those of Prague 1. “Most of the reconstructions occurred a few years back, so it’s a more mature neighborhood, though improvements continue,” notes Frank Hanečák, director of Hanex real estate agency. According to the municipal offices of Prague 2, the district occupying the largest portion of Vinohrady, roughly 75-80% of its buildings are privately owned. The town owns 200, or about 12%, of the buildings in Prague 2 and has rented, in its estimation, roughly 40 attic flats in Vinohrady, with another 30 to go at the start of 2006. 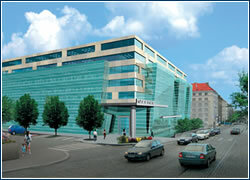 Orco Property Group was one of the first developers to recognize the great potential of Vinohrady. It has made an indelible mark in the district since it began to purchase and reconstruct buildings there in 1991, and its success has been used as a model by many other developers in Prague. “We’ve always liked the area and truly believe in it,” says senior vice president Aleš Vobruba. “It’s very close to the center, has reasonably good accessibility, a very pleasant environment for residential and small/medium offices,” he says, adding that there is also no flood of tourists as in Prague 1. In addition to its head office, Orco’s sites in the area include six medium sized office buildings, nine buildings with long-term lease apartments, three extended-stay hotels, and a private clinic, at Londýnská 39, opened in September. Two other projects of significant magnitude are adding their mark. Korunní Dvůr, designed by architectural studio CMC, blends reconstruction of historic buildings including an old brewery with modern flats and lofts in Prague 10. It consists of 250 flats, plus commercial space, all of which is being offered for sale, save for space signed for rent with Delvita. “Both clients and neighbours will benefit from services there, including legal, tax/accounting, dental, and real estate. The architect Slavíček is already providing services to our clients, both residential and office,” says project manager Renata Součková of developer Africa Israel. 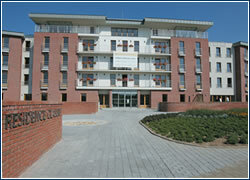 145 flats have been sold. Churchill Square, designed by Aukett, is on the Vinohrady’s extreme inner end on a plateau overlooking all of Prague 1, not far from the top of Wenceslas Square. “Location is the key with our development,” says Václav Šlosar, chairman of the board for developer CR-City. “It is one of the last opportunities to develop in an established, desirable residential location.” Everything, Šlosar points out, is on the district’s doorstep: culture, shopping, restaurants, transport access, and parkland. Future completion of the D-line metro will place a station directly beneath the development. The residential portion is the first to go ahead in order to capitalize on demand. “We’ve just started marketing, and it’s already getting a lot of attention,” says John Breaux of Lexxus. The ACRED Group is no stranger to introducing new concepts to the country. True to form, the developer celebrated the opening of Residence Classis in Průhonice in October, the Czech Republic’s first luxury complex for seniors. Inspired by similar concepts in western countries, Residence Classis is designed for those who don’t want to compromise their quality of life, even as they grow older. Aside from 62 rooms, including two large rooftop flats, all for long-term lease, the residence offers a basement swimming pool and whirlpool, a ground-level bar with billiard table and restaurant – complete with a fitness studio and art studio on upper levels, as well as a salon and wellness center offering massages and more. “We wanted to combine two aspects: an independent life where people can enjoy their own apartment, and at the same time, the greater security of knowing that if they need help, it’s available. Six rooms with full 24-hour care are designed for this,” notes Petra Caineová of ACRED Group. The 200-hectare Průhonice Park and chateau is a short walk, and several of the services are open to the public, including the restaurant and wellness center. “We also wanted to keep it open to the community, not only connecting it to the neighborhood, but allowing residents to interact with others,” Caineová adds. 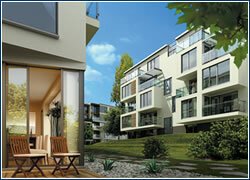 Prices begin at CZK 38,300 per month, including services; ACRED cooperates with UNIQA for annuity arrangements. »My first job was helping out on a construction site, mixing concrete, running with the wheel barrow, making tea etc. Why did you decide on a career in architecture? »Originally I started a business degree, then I switched to journalism, and only after this did I think of architecture on the basis that I might leave something behind other than a trail of paper. Did you imagine 10 years ago you would be doing business in Prague? »Ten years ago I felt like I would never make it. Finally one of my clients said they were looking to put together a team in Prague. I jumped at the chance. Do you follow any credos in terms of management? What do you like most in your work/line of business? »The best thing is the way that all of the issues and ideas eventually appear in the form of a building, which resembles the raw emotions of someone that you know intimately. »Working seventy hours and more a week. What was your most rewarding project? What do think most people don’t know about you? »Probably that I genuinely enjoy what I do. If it weren’t for this simple fact I would have moved on to probably more lucrative, but certainly less stimulating pastures years ago. »Before I had kids I used to paint. I bought canvass and new paints recently and have a series of four paintings in mind to work through. »Kensington place just off Nottinghill gate.